Humidity can really wreak havoc on your hair. Mine fights a constant battle against Singapore’s temperamental tropical climate. On top of that, like loads of ladies out there, I spend most of my day in a dry air-conditioned environment. My hair is mostly pretty smooth, but a combination of heat and air-conditioning makes my hair limp at the scalp, frizzy at the ends, and pretty much dull-looking at the end of the day. Even after a steamy shower and loads of TLC, the ends of my long hair (slightly above the waist) still feel dry and frizzy. 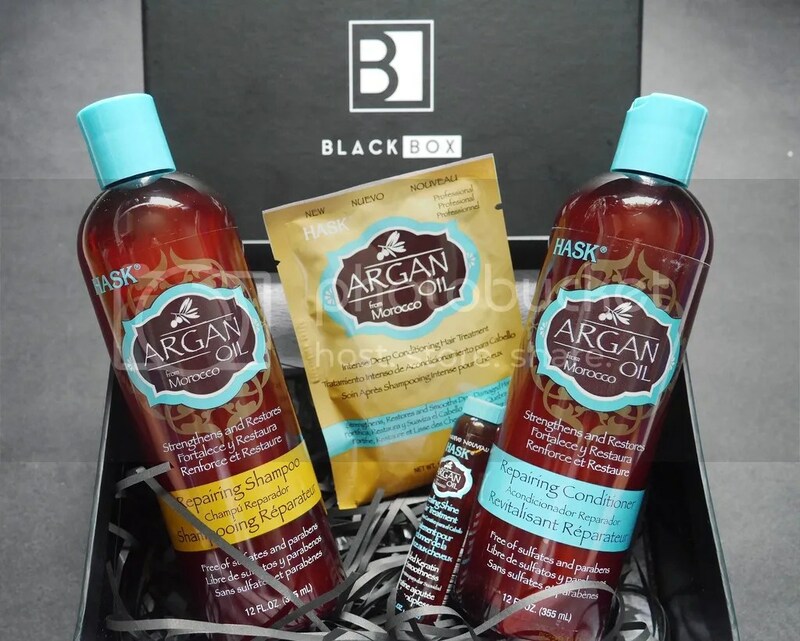 I was so glad to be introduced to the HASK’s Argan Oil series. They contain Argan Oil from Morocco, and are loaded with vitamins and antioxidants to repair, strengthen and moisturize hair. Also known as “liquid gold,” Argan Oil is a precious, time-honored beauty secret, and when used in haircare products, is great at taming frizz and adding shine to your mane. No kidding – I noticed an immediate difference in softness, shine and overall condition of my hair after just one use! At Blackbox SG’s online store, the recommended products come in a gorgeous, convenient set! 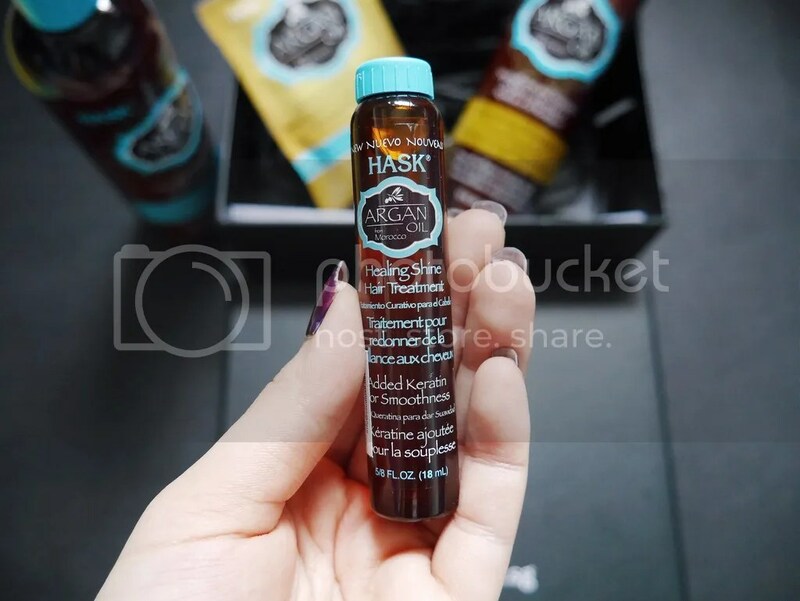 If you haven’t heard, HASK is a collection of hair care products featuring exotic oils and other unique ingredients from around the world. Rest assured that all its products – Shampoos, Conditioners and Shine Oils – are free of sulfates, parabens, drying alcohols, phthalates, gluten and artificial colors, which are known to damage your scalp and hair. Fun fact: HASK is used on more film and TV sets than any other hair care brand! Including: Criminal Minds, Scream Queens, Modern Family and How To Get Away With Murder. Seriously, all my favourite shows? So why argan oil? Long before it entered mainstream haircare, Asian, Indian and northern African women have used argan oil to keep their hair silky-smooth and healthy. The oil, extracted from the fruit of Argan trees found predominately in Morocco, helps seal the hair cuticle to protect against environmental damage. Specifically, the molecules in Moroccan argan oil may be small enough to penetrate the hair cortex, and hence are able to stimulate smoothening of frizzy hair and healthy growth from within the hair shaft! So the oils do go deep within your hair to heal the frizz. Amazing isn’t it. People in Morocco use argan oil on salads, during body massages as skin essential oils and on hair as a conditioner. It is also widely used for several first aid purposes, including bug bites, skin rashes, and infections. The oil also has therapeutic properties as it is rich with both Vitamin A and E. The trocopherol from the vitamin E boosts hair cell production and regeneration. 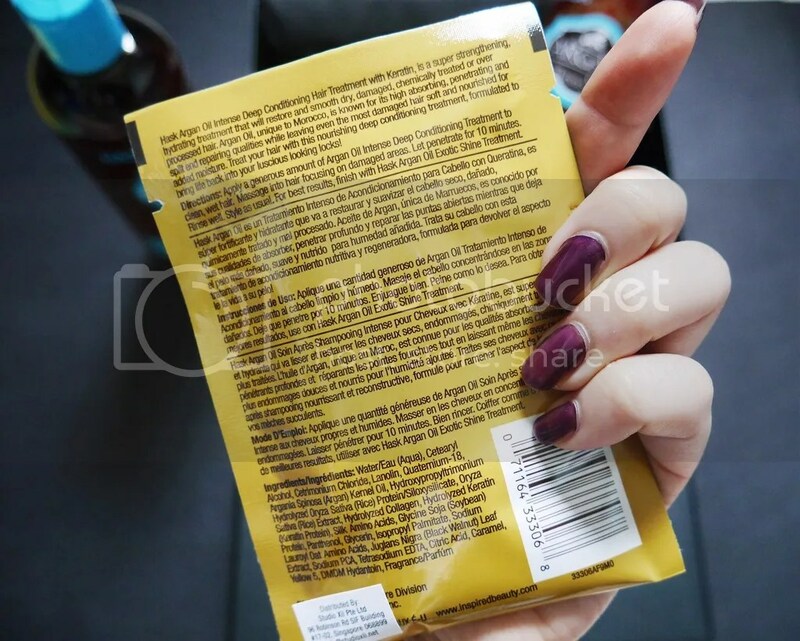 Let’s take a closer look at the individual products in this exclusive set! This shampoo is infused with argan oil which repairs and prevents breakage to damaged hair as it deeply penetrates and moisturizes the hair shaft. My mane feels super-soft, tame and glossy, the way it feels when I’m in a seasonal country during Spring. Seriously, my hair agrees with cool air in spring. But since tropical heat can’t be avoided I just need to beat it with a crazy moisturising product. 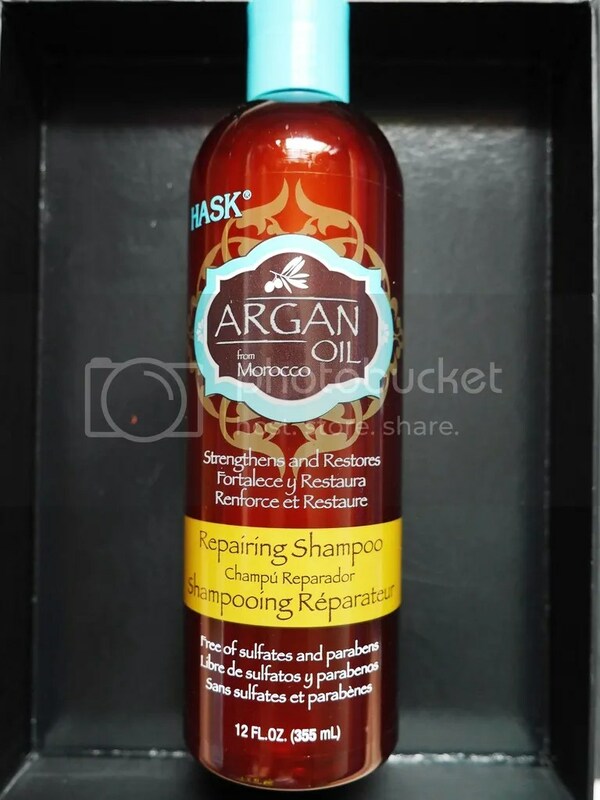 The Argan Oil Repairing Shampoo’s invigorating scent (slightly sweet and tangy), has this uplifting and refreshing effect, which feels great in the mornings, as it tops off my need for perk-me-up coffees. The shampoo lathers moderately, and doesn’t leave behind a sticky, oily residue as you would expect natural oils to, hence my hair didn’t feel heavy or weighed down after washing. Haircare Tip #1: To avoid damage to frizzy hair, dry your hair with a towel, and allow the strands to dry without blow drying. Heat can often cause further long-term damage to the hair shaft in humid weather so avoid heat styling wherever possible. Directions: Apply generously to wet hair. Massage into a luscious lather, rinse thoroughly and repeat as often as you like. 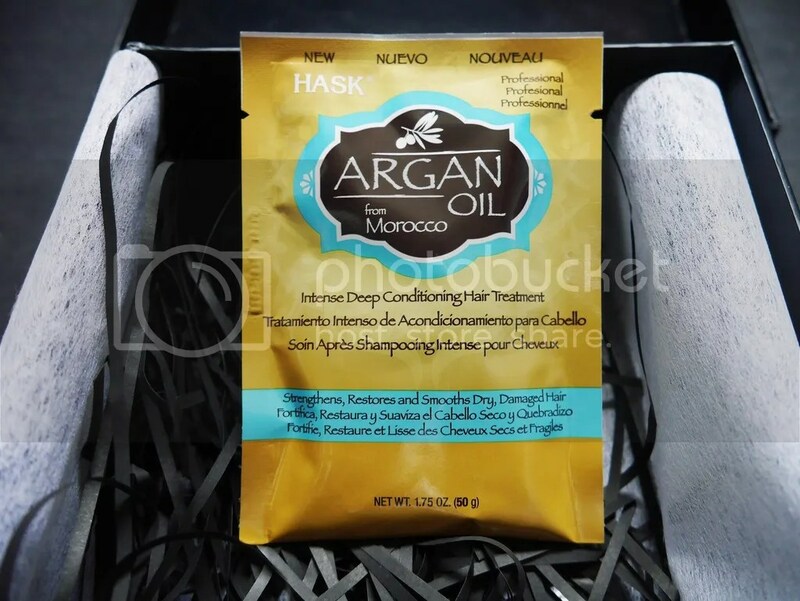 For the sleekest, healthiest-looking hair imaginable, follow with HASK Argan Oil Repairing Conditioner, of course! The Argan Oil Repairing Conditioner, like its accompanying shampoo, is perfect for dry, damaged or colour-treated hair. As promised in its product description, the conditioner acts as an intense restorative treatment that helps you bring life back to dull, damaged hair. I love the understated scent of this product – it is slightly less sweet than its shampoo, but still as refreshing and uplifting. Again, no oily or stickiness at all, and my hair doesn’t feel weighed down after washing. To add on to its frizz fighting benefit, the conditioner contains soy protein that helps with hydration and strength. As I only apply conditioner to the ends of my hair, I believe a bottle of conditioner like this can last quite a while, since I need only use a small pea-sized amount to tame my waist-length hair, right down to its tip. Haircare Tip #2: When conditioning after shampoo, wash off conditioner using cold water. Cold water causes the cuticles of the hair to contract, simultaneously adding shine and taming frizz, though there are some debates about this. Some scientists, doubt the effectiveness of cold water since hair cuticles aren’t living cells hence they shouldn’t contract. Cold water has always worked well for me in taming the frizz, and I swear firmly by this! Directions: Shampoo hair and remove excess water. Apply generously, leaving on for 1-2 minutes, or as long as it takes to shave your legs! Rinse thoroughly and behold ready-to-style, gorgeous hair! For the sleekest, healthiest-looking hair imaginable, follow with HASK Argan Oil Repairing Shine Oil. This product is a supplement to the daily shampoo and conditioner routine, and is a weightless and super-strengthening conditioning treatment that helps repair and smooth out hair using nourishing Argan oil and keratin. After 2 uses, I found some hope to my split ends – even the most damaged parts of my hair feels softer with the added moisture! All the damage from styling and blow-drying is magically reversed in a couple of uses – my mane really feels pampered and nourished. I can’t reiterate how much softness and strength my hair has regained after using this intense conditioner. Literally, all I had to do after deep conditioning was to finger comb my hair, and it feels perfect. Seriously I have found the ‘spring‘ that my hair needs to restore moisture and smooth out damaged, over-processed hair. If you look at the ingredients, this is really an all-star power-packed product! 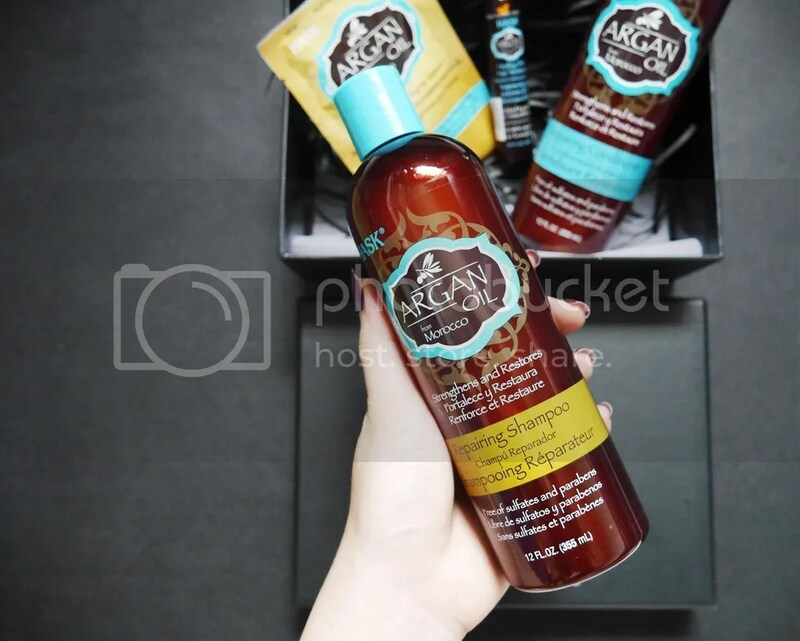 Directions: Apply a generous amount of Argan Oil Intense Deep Conditioning Treatment to clean, wet hair. Massage into hair focusing on damaged areas. Let penetrate for 10 minutes. Rinse well. Style as usual. For a good number of reasons, many of us face hair fall issues. Argan oil is scientifically proven to be a good product for hair re-growth and cell regeneration. The Argan Oil Repairing Treatment Vial acts as a lightweight, alcohol-free serum / oil that absorbs instantly to provide frizz-free shine without leaving an oily residue. When applied to your scalp and hair, you can potentially treat your hair fall issues! For a week, I smoothed out a bit of this oil to my wet hair ends after every shower, and it has improved my hair texture greatly. The serum is oily, but dries fast, and should not cause a mess so long as you are careful not to let it drip onto any white surfaces. Like all the other products in the series, the serum has a lively, invigorating scent, which I’m in love with. Best parts about this product? It doesn’t make your hair stiff and oily to touch like most hair oils do, and you also get a choice to either use it on wet or dry hair. Whichever works for you. Haircare Tip #4: Apply a pea-sized amount of smoothing serum, like the Argan Oil Repairing Treatment Vial, to damp hair with your fingers. Concentrate a bit more of the product on any areas prone to fly-aways as well as on the ends of the hair shafts, where dryness can occur. Directions: Can be used on both wet and dry hair to create a silky, smooth finish. Apply a coin-sized amount evenly throughout hair, avoiding the root area. Style as desired. 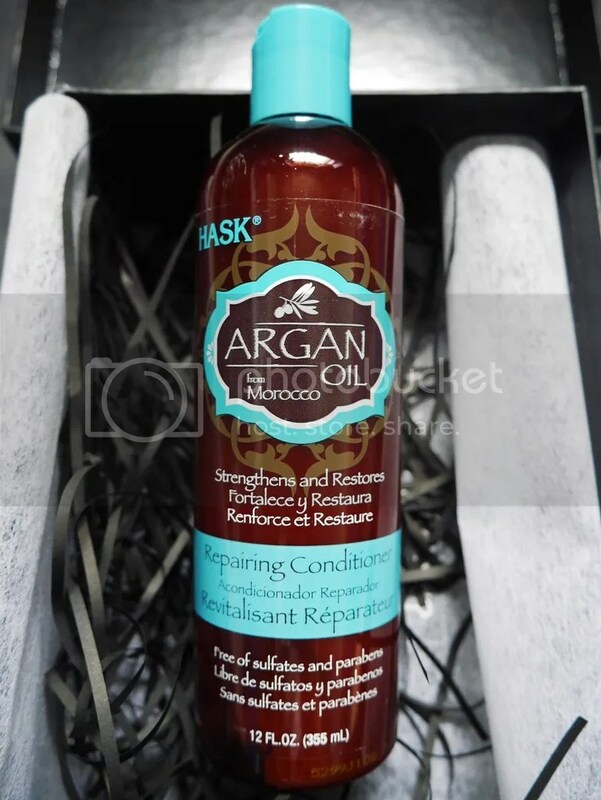 For the sleekest, healthiest hair imaginable, use HASK Argan Oil Repairing Shampoo and Conditioner. I’m loving this haircare set because everything in this lovely box smells great! I’m big on fragrances, and if the product smells good, it’s a huge bonus, and personally it’s my deciding factor as to whether I would continue to use the product for the long-term. And definitely I would reuse this over and over, for the great benefits they have on my hair. Also a huge bonus – the exclusive pack saves you time in choosing complements to your haircare products. Just purchase this set for your complete haircare treatment. I’ve always loved how BlackBox packages, beautifies and distributes their products in their classic black box! Haircare Tip #6: Brush your hair regularly to help distribute its natural oils. Brushing your hair while hanging your head upside down helps better distribute the oils from your scalp/roots onto the rest of your hair. Weird but true. Would you believe how affordable this box set costs? The Exclusive Pack is now available at Blackbox SG at a promotional price of $29.90/set (U.P $43.60), limited sets only. Grab yours now! 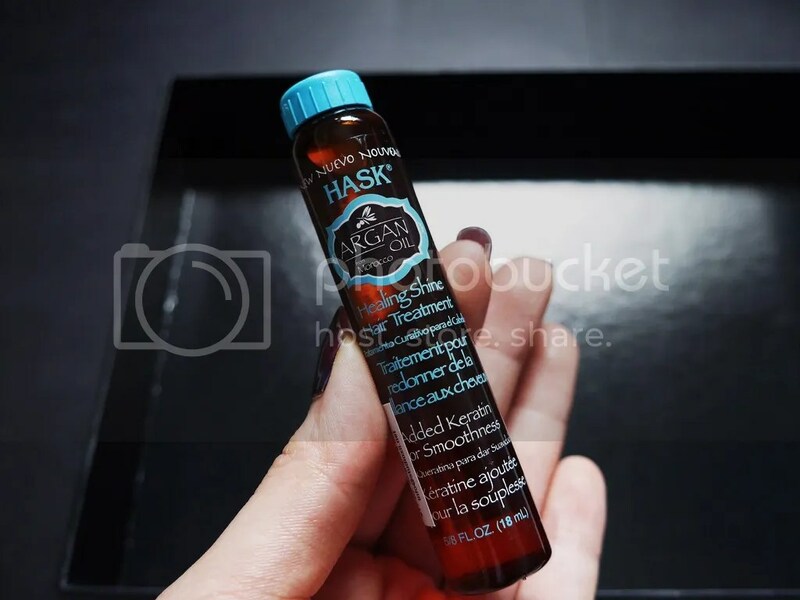 HASK is a collection of hair care products featuring exotic oils and other unique ingredients from around the world. The range includes shampoos, conditioners, deep conditioners and shine oils based on the key ingredients of Argan Oil, Monoi Coconut Oil, Charcoal Citrus Oil, Macadamia Oil, Keratin Protein Oil, Bamboo Oil, Kalahari Melon Oil, and Mint Almond Oil. HASK Shampoos, Conditioners and Shine Oils are free of sulfates, parabens, drying alcohols, phthalates, gluten and artificial colors. Each system was developed to target and solve specific hair care needs. Initially introduced in Europe in 2012 with great success, distribution of the HASK Exotic Oil range has expanded worldwide over the past four years. The range appeals to women around the world of all ethnicities and with all hair types. Utilizing high quality ingredients, luxurious fragrances and fresh packaging, the HASK Exotic Oil range provides consumers with high-performance, salon quality results at an affordable price.